Heading into Sunday, FC Dallas were unbeaten in 2018 MLS play. NYCFC ended that with a 3-1 win. VAVEL USA author Jay Stucchio rates the winners. After losing their unbeaten streak to start the season last weekend to the Portland Timbers, New York City FC was handed the task to end FC Dallas' unbeaten start. 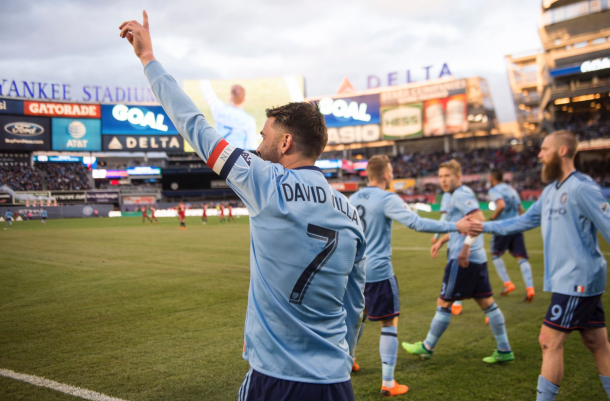 A convincing 3-1 win for the boys in blue saw David Villa score his 400th and 401st professional goals. Sean Johnson (8/10) - NYCFC's goalkeeper has been no stranger to big saves since his move to the Big Apple and Sunday was no different. There was little 28-year-old could do on the first goal but he made big saves to make sure the away goal tally stayed at 1. A huge step up from last week where he made multiple mistakes. Ben Sweat (7/10) - Sweat played a role in the game's opening goal as he played a give-and-go with David Villa. Sweat was sound defensively and helped out going forward on the left wing a bit as well. A typical performance from the Florida native. Alexander Callens (7/10) - A quiet night for the Peruvian, but sometimes that is a good thing as a defender. Rarely called into action on Sunday, Callens usually dealt with it well when called upon. His left foot was helpful in building from the back as well. Sebastian Ibeagha (8/10) - The 2017 USL Defender of the Year showed he could do it in MLS as he got his second MLS start in Maxime Chanot's absence. Ibeagha made a plethora of big tackles in his own third and didn't look out of place when distributing the ball out of the back. Solid performance for NYCFC's newest center back. Anton Tinnerholm (7/10) - The Swede played less of a role than he usually does but scoring a goal every game is a bit much to ask of a fullback. The Swede did well to win a penalty which gave his side the lead late in the first half. Alex Ring (8/10) - The Finnish international filled his responsibilities as per usual. It's rare that you see Ring make multiple mistakes and Sunday wasn't a rarity. Yangel Herrera (7/10) - If not for being largely responsible for the first goal, the Venezuelan would have a better rating. Being top two in both fouls committed and fouls suffered mean Herrera is usually heavily involved and Sunday was no different. The Manchester City loanee was heavily missed vs the Timbers a week ago but his presence was felt vs FCD. Maxi Moralez (7/10) - The playmaker wasn't directly involved in any goals but played a key pass out wide to Tinnerholm which led to the penalty. NYCFC's #10 found himself in good spaces and nearly grabbed a goal in the 50th minute. Not a bad outing for the playmaker. Jo Inge Berget (7/10) - Not your traditional winger, and certainly not somebody you'd expect to be there in NYCFC's system, Berget still does the small things right. His pressing is good, and his presence in the box drags attention away from other players.It was his shot off the post which led to the opener in the third minute. Jesus Medina (7/10) - The Paraguayan loves to show off his skills but rarely had the opportunity on Sunday. Despite that, the 20-year-old Designated Player still found himself on the scoresheet before being substituted in the 73rd minute. David Villa (9/10) - El Guaje had a special day. The Spaniard scored his 400th career professional goal and then went ahead and scored his 401st. He was also the main creator of the other goal. The captain made sure fans didn't forget him after his month-long absence earlier in the campaign. Ebenezer Ofori (6/10) - The Ghanian was brought in to sure things up in the middle and he did just that. He didn't have a particularly large presence but he made sure FC Dallas didn't crawl their way back into the match. Rodney Wallace (6/10) - Coming in alongside Ofori, Wallace was brought in to add energy on the wing and he did that. Like Ofori, he didn't have the biggest impact but he did what Patrick Vieira sent him out to do. Saad Abdul-Salaam (NA) - We didn't see enough of the 26-year-old defender to give him a rating as he was an 87th-minute replacement for David Villa.